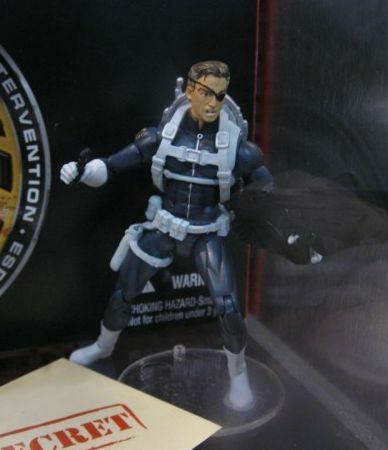 At this years New York Comic Con, it was revealed by Hasbro that there would be a Nick Fury mail-away exclusive figure for the Marvel Universe line. It was hinted that you should save your packaging from the first few series of figures for that mail-away, which led a lot of collectors to believe that it would be a “Proof of Purchase” type offer. Recently some members of the Fwoosh have found some of the figures from Wave Four, which contained a form stating that the figure could be obtained by signing up for a subscription to Marvel Digital Comics at $24.99 ($8.33 a month) for a 3-Month subscription or $59.88 ($4.99 a month) for an annual subscription, between 06/01/09 and 12/31/09. There was also a web address listed as marvel.com/nickfury which has not gone live yet. Unfortunately, for international collectors, the offer is also limited to only the United States and Canada.